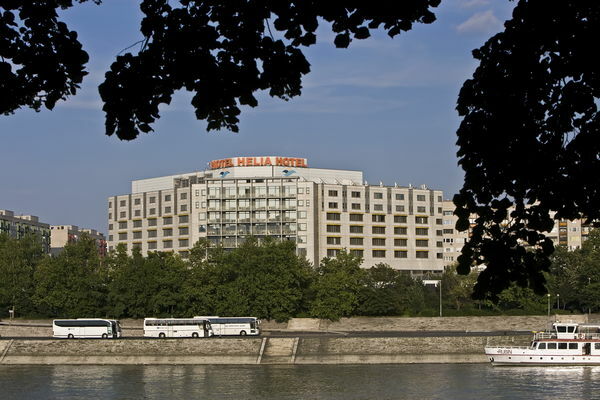 Centrally located superior first class, conference, spa and wellness hotel on Pest embankment of the river Danube, opposite Margaret Island. Guest Room Information: 262 guest rooms (249 double rooms, 8 suites, 5 handicapped rooms) including 4 suites with saunas and 4 business suites. 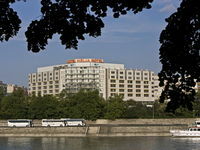 Most of the rooms are overlooking the River Danube, Margaret Island and Buda hills. All rooms have bathroom, radio, minibar, colour satellite TV (including CNN, TVE and JSTV), alarm clock, direct-dial telephone and individually controlled air-conditioning. Rooms for the physically disabled and connecting rooms are available. The whole territory of the Hotel is non-smoking. Wireless internet use is free of charge in the public areas of the hotel (lobby, bar, coffee shop, restaurant). Food and Beverage: Specialities of the international and Hungarian cuisine are available, live music during lunch and dinner time. Our Café offers fresh salads, sandwiches and famous Hungarian Cakes. Conference Facilities: Our banquet and conference rooms are located on the first floor, all with daylight, most of them overlooking the Danube. All the meeting rooms are air-conditioned, soundproof and have a full complement of the latest audio-visual equipment. Helia Conference Room plus 8 smaller conference rooms can accommodate up to 1000 delegates. Business Centre: Telephone, telefax, photocopying, dictation, translation and other secretarial services plus computer hire enabling broadband Internet access. Fitness Complex: Unlimited use of indoor swimming pool, thermal baths, sauna, steam bath, Jacuzzi, fitness room, sunbathing terrace for hotel guests. Beauty salon, massage and solarium are also available. Medical Department: A comprehensive and personalised health care programme including hydrotherapy, electrotherapy, massage, parafango, inhalation and gymnastics under the supervision of highly qualified, multilingual physicians and staff. • Breakfast is not included in room rates. It is available at 12 EUR per person. • Half board is available at 24 EUR per person. A Credit Card number is required to confirm and guarantee your reservation. Your credit card will not be charged in advance. Cancellation Policy: No cancellation charge if the reservation is cancelled prior to 4:00 PM (hotel local time) at the day of arrival. In case of late cancellation and no-show you will be charged with one night's room rate. Public rates include VAT and local tax, but no breakfast. Travel period: 2014. április 8 – október 31. Available from minimum 3 nights stay on discounted rate. A Credit Card number is required to confirm or guarantee your reservation. Your credit card will not be charged in advance. Rates include the unlimited use of the spa facilities: indoor and – in the season – outdoor pools, thermal baths, adventure pool, sauna, aroma and steam bath, all group exercise classes: aqua jogging, aerobics, step, yoga, Danubius Premier Fitness Club, bathrobe use, use of parking place, VAT and local tax. Buffet breakfast is excluded: EUR 12/person (not compulsory, can be requested on spot). Cancellation Policy: No cancellation charge if the reservation is cancelled 48 hours prior to the day of arrival. In case of late cancellation and no show you will be charged with one night's room rate. Rates include buffet breakfast, the unlimited use of the spa facilities: indoor and – in the season – outdoor pools, thermal baths, adventure pool, sauna, aroma and steam bath, all group exercise classes: aqua jogging, aerobics, step, yoga, Danubius Premier Fitness Club, bathrobe use, use of parking place, VAT and local tax. Book your room at least 10 days in advance. Once a reservation is confirmed, your credit card will be charged for the amount of first night booked. Cancellation, modification is NOT possible. The prepaid amount is NON refoundable in case of no-show, modification and cancellation. Public rates include VAT and local tax, but no breakfast. • Reservations can be cancelled free of charge until 16:00 on the day of arrival.